I never uploaded these shots of the three survivors of the raccoon ravages this fall. Maybe not since all the rain and cold, but definitely before that, we were still getting nightly visits from the raccoons. 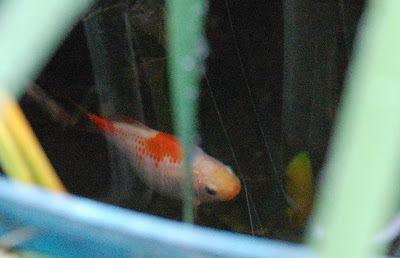 They totally cleaned out the shallow pond (formerly known as the "Goldfish Pond") - clearing out all remaining baby fish, snails, slugs, and some of the plants. 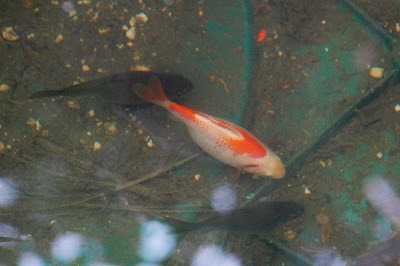 I've decided on a stalemate - they can drink the water and eat whatever they find in that pond as long as they can't get into the deeper koi and round pond. 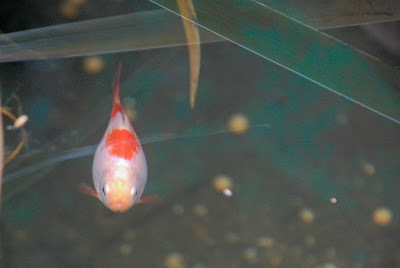 With the rain temporarily shorting out the fountain outlet, I got these shots of the last three goldfish. Two are still black and the third one began turning colors before the attacks. 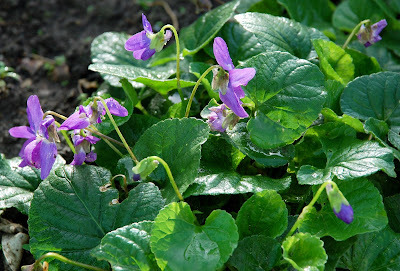 On another topic, these violets are beginning to really take off now that we are getting plenty of rain.